Hello Loves. 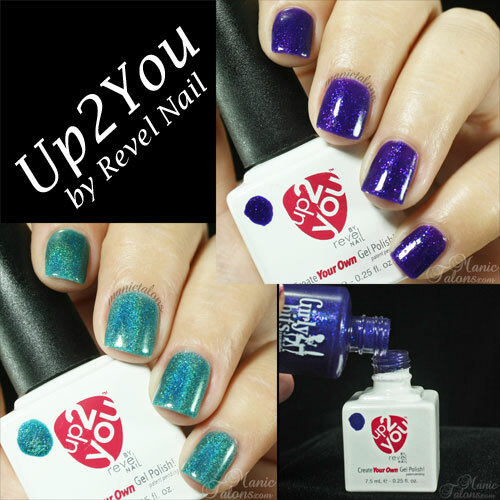 I have a new product from Revel Nail to show you today called Up2You. 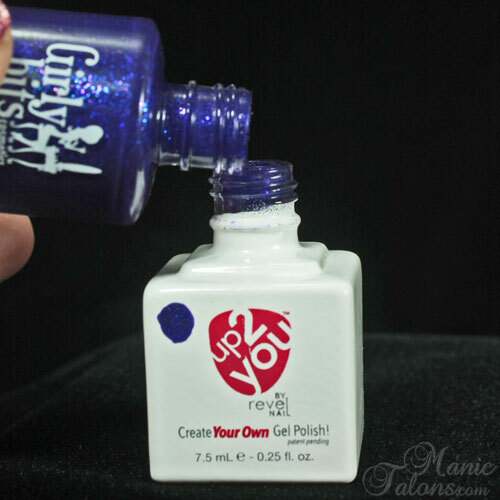 Up2You converts nail polish to gel polish one bottle at a time. Up2You is a little different than the other system I reviewed a few months ago. Instead of mixing a little at a time, Up2You is designed to create a full bottle of gel polish out of your favorite nail polish. It is also a 2 step system in that it does not require a base coat. So how does it work? 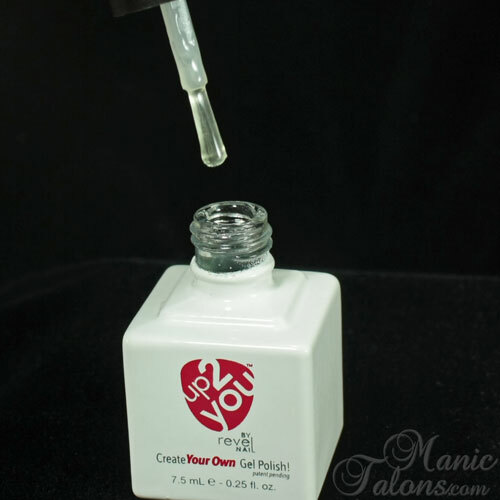 The bottle of Up2You is a full sized 0.5 fl oz bottle but contains only 0.25 fl oz of mixing solution. It is a higher viscosity gel than we are used to seeing with gel polish, which allows it to mix with the polish without diluting the color as much. One you have mixed your favorite polish with the Up2You, the rest is basic gel polish application. Apply one thin coat of your Up2You mix. Cure for 30 seconds in LED or 2 minutes in UV. Apply a second coat of your Up2You mix. Cure for 30 seconds in LED or 2 minutes in UV. Apply a thin coat of Soak Off Gel Top Coat. Cure for 30 seconds in LED 2 minutes in UV. Wipe the nail with isopropyl alcohol or gel cleanser to remove the tacky layer. Enjoy your new gel polish mani! Ready to see her in action? The most difficult part for me was deciding which of my polishes to convert to gel. As you know, 90% of my regular polishes are indies. I stood here looking at my rack for a long time trying to choose which ones to convert. I finally decided on Girly Bits Seriously Sassy and KBShimmer Up and Cunning. These are two that I remember thinking "Dang I wish I had this as gel polish!" when I swatched them. Up first is Seriously Sassy. Seriously Sassy is a thicker polish and is loaded with chunky shimmer or micro glitter. It did quite well when mixed with Up2You. 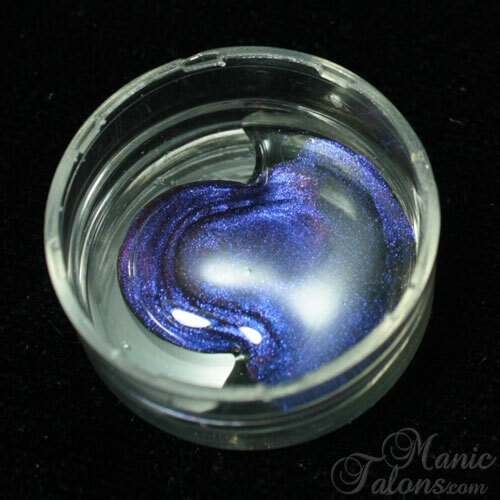 The second color I chose to test is KBShimmer Up and Cunning. Because, well, you know I had to try it on a holo! I'm still dreaming of the day one of my favorite brands creates a true linear holographic gel polish. ;) The results with Up and Cunning are a bit different than my results with Girly Bits Seriously Sassy. 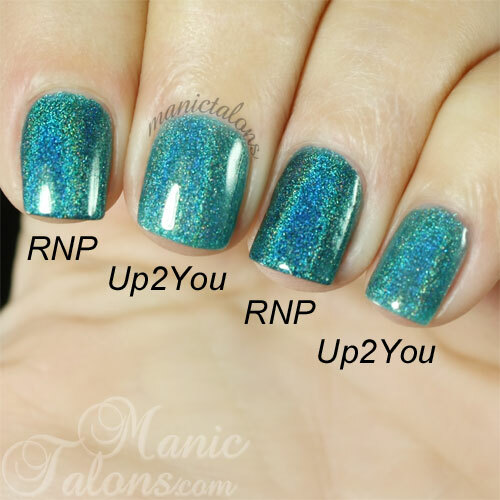 The formula for Up and Cunning is a little thinner, which is typical for holographic polishes. 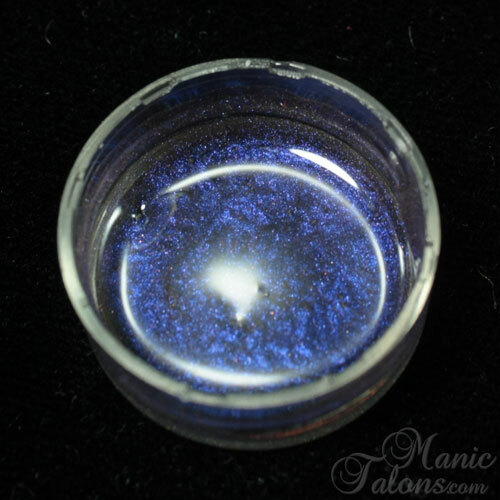 The thinner base helps the holo pigments pop. The Up2You version of Up and Cunning still has a nice rainbow, but it is not as strong as the pure KBShimmer version. The color is also diluted a bit. Here's the comparison photo. One more coat of the Up2You version would improve the shade and depth, I think. But I wanted to stay consistent and used two coats. So, how does it wear? Well...eh...yeah...I'm not the best person to ask about that one. We already know from my original Revel Nail Gel Polish Review that the standard Revel Nail base coat doesn't work for me. So it's not a surprise that this system doesn't wear well for me either. It does, however, wear beautifully over the custom base that Revel Nail created for my Teflon nails. So when it comes to wear, it depends on your nails. If your nails are typically dry and porous, it will likely wear beautifully for you. If they are super smooth and flexible, you might want to use your favorite base gel under the color mix. Here's the part I know you've been waiting for - my honest opinion. Because you know I'm going to give it to you. ;) I love that this system is rather fool proof. If you can pour polish from one bottle to another, you can create the perfect mix. There's no guessing and trying to judge the size of drops and puddles. Having it in the bottle also eliminates the issue I found with mix-as-you-go systems of the mix turning goopy half way through your mani. The bottle keeps the solvents in the polish from evaporating so the consistency of the mix is stable. The addition of the mixing balls was genius! I know of several gel polish brands that could learn a few things from Revel Nail on that one. So...I did a little thinking. The bottle of Up2You is filled half way. That makes the perfect mix 50/50 gel to polish. I took my third bottle of Up2You and started mixing single servings of color. It works beautifully, though it does put the guess work back into the mix. But hey look...options. :) Just be sure to label your bottle if you start mixing one off colors. You wouldn't want to get it confused with a new bottle and mess up a mix later down the road. I should also note that when mixing a little at a time, you only want to mix enough for one hand (if you're DIY...you could probably mix for a full mani on a client since there's less down time between hands). The solvents in the polish will start to evaporate as you are applying it and it will get goopy. *Up2You was provided by Revel Nail for my honest review. This post contains Amazon Affiliate links. Purchases through those links generate commissions that help fund this site. All other links are courtesy links and do not benefit ManicTalons.com. This stuff looks awesome. I've been using Megamix gel to convert my nail polishes into gel polishes, but I really like the idea of having the mixture in a bottle ready for future applications. Yup smaller bottles for sure! I have indies that are rare/HTF cause they are no longer in business. p.s. any luck with mixing up a matte polish?